This page contains a single entry from the blog posted on May 29, 2006 12:34 AM. 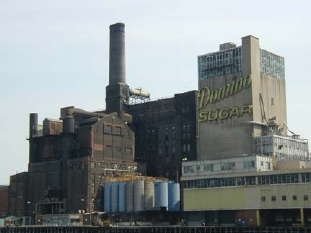 For much of its history, the Domino Refinery was operated by the American Sugar Refining Co. 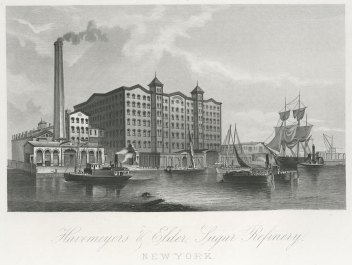 The American Sugar Refining Co. was one of the most prominent and significant industrial operations on the Brooklyn waterfront in the 19th and 20th century. 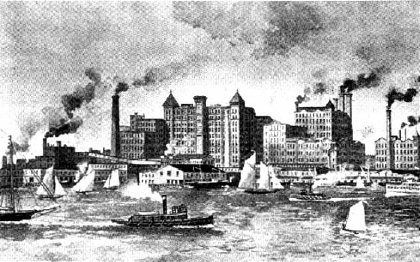 The factory was a major source of employment for residents of the Eastern District (north Brooklyn). 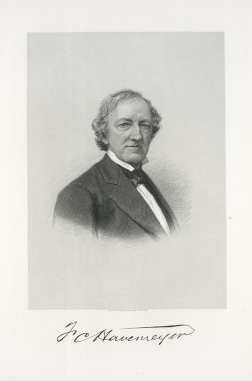 The Havemeyer family’s presence in Brooklyn began on one block at this site in the 1850s. 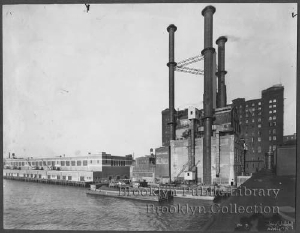 By the early 20th century, the Havemeyer’s controlled most of the Eastern District waterfront, from the Williamsburg Bridge to the Bushwick Inlet. Their interests in the American Sugar Refining Company led to the development of the Austin, Nichols & Company Warehouse (Cass Gilbert, 1913), the largest grocery wholesaler of its time, and one of the earliest expressive uses of reinforced concrete. 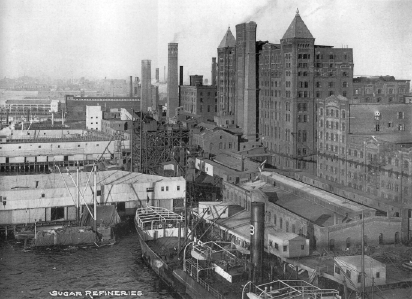 The Havemeyer family also developed the Brooklyn Eastern District Terminal, one of the largest pocket railroad depots in the country, which served most of the north Brooklyn waterfront, as far inland as Wythe Avenue. American Sugar Refinery site plan, 2006 (click to enlarge).The center block (tax block 2414, lot 1), from South 3rd Street to South 2nd Street, contains eight significant buildings and a number of smaller structures. The Finishing House (#3), located on the corner of South 3rd Street and Kent Avenue, and the Pan House (#2), located on the corner of South 2nd Street and Kent Avenue, share a common 10-story brick façade that runs the entire length of Kent Avenue between the two streets. The Filter House (#1) is a 13-story brick structure located roughly in the center of the block, running from South 3rd Street to South 2nd Street. Collectively, the Filter House, the Pan House and the Finishing House, all of which were completed in 1884, are referred to as the Processing House. 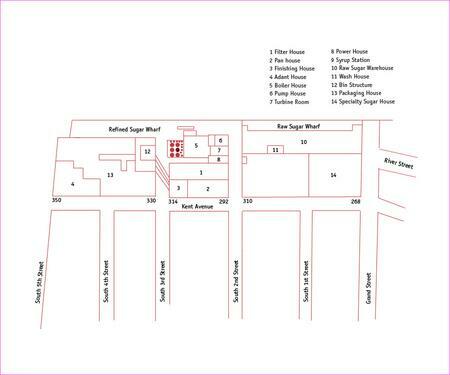 The remainder of the center block contains the Boiler House (#5), the Pump House (#6), the Turbine Room (#7), the Power House (#8) and the Syrup Station (#9). 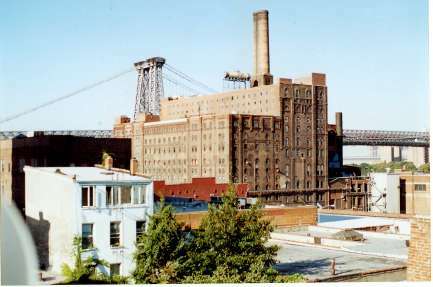 These latter buildings occupy the western portion of the block, facing onto the East River, and were constructed between 1927 and 1962. 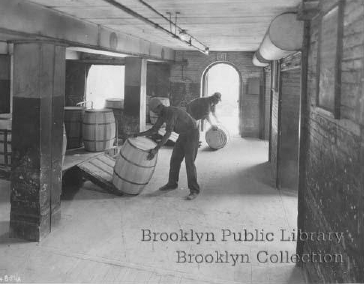 The round arch was a typical feature of storehouses along the southern Brooklyn waterfront, from Fulton Ferry to the Atlantic Basin in Red Hook. In these storehouses, the round arch had the functional benefit of allowing taller openings for loading purposes without requiring less structurally stable flat lintels. The round arch was more expensive to construct that segmental arch or flat lintel, and was therefore much less common in north Brooklyn, where factories, not storehouses, dominated. At the Havemeyers & Elder buildings, the decoration of the façade, with their prominent brick piers and corbelling, was considerably more elaborate than in the storehouses of south Brooklyn. 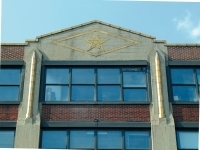 This level of decoration was quite rare in other round arch industrial buildings in Brooklyn. The façades have projecting brick piers at the corners and along each the façade, creating vertical divisions. The Kent Avenue façade of the Pan and Finishing House is arranged symmetrically in a 2-2-2-9-2-2-2 pattern, with three outer bays of two window bays in width flanking a center bay nine windows in width. The north and south facades of the Pan and Finishing House have a 1-3-1 arrangement, with single end bays, one window bay in width, flanking a center bay, three window bays in width. The west (river) façade of the Filter House has a similar symmetrical composition top the Kent Avenue façade, with a slight variation in the arrangement of bays. This façade has a 2-3-2-7-2-3-2 arrangement. The northern and southern bays, each 2 window bays wide, were originally capped with pyramidal roofs set on a projecting corbelled brick cornice. These towers were removed sometime before 1928. Pyramidal parapets capped the centermost 2-window bays. These parapets were removed sometime after 1928. The center of the west elevation is dominated by the boiler house smokestack, which rises almost twice as high as the Filter House itself. The base of the smokestack, up to the roof level of the Filter House, is original. This portion of the stack has similar corbelling and decoration to that found elsewhere on the buildings. The distinctive brick oval stack that rises above the roof of the Filter House was constructed before 1936.7 This stack is more plainly detailed than the rest of the building, with a simple corbelled brick cornice at the top of the stack and a series of 8 metal bands spaced vertically along the stack. The north and south elevations of the Filter House have asymmetrical arrangements. The western bay on each façade has two closely-spaced windows (and were originally capped with pyramidal towers described above). The center bay has two widely-spaced windows. The eastern bay has one window only. The east elevation of the Filter House, which was reconstructed at an unknown point in time, has an undecorated brick façade with flat-lintel windows. The next oldest structure on the American Sugar Refinery site is the Boiler House. 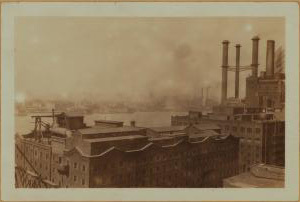 This six-story building is located on the East River between South 2nd and South 3rd Streets, immediately west of the Processing House and south of the Power House. The boiler house was constructed in about 1927, and replaced an earlier boiler house dating to 1884โบนัส 100 % กีฬา8. At the same time, the distinctive oval-shaped double chimney that rises above the Processing House was constructed. 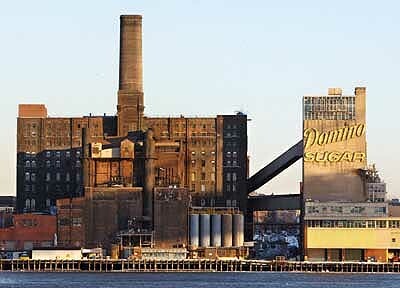 This stack, a Williamsburg landmark in its own right, replaced an earlier stack that served the old boiler. I live in Bay Shore, NY where supposedly one of the Havemeyers lived. There is also an island in the Great South Bay named Havemeyer Point. Is there any way I can gat some more information about this. 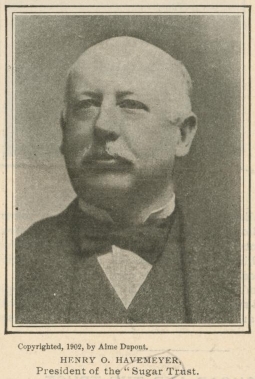 Bay Shore is currently celebrating 300 years and the history of the Havemeyer family would be a great addition.